Are you interested in animals and plants and how they interact with each other and the physical environment? Are you interested in sustainability and the conservation of natural resources? Are you concerned about pollution, loss of biodiversity, sustainability, and ways humans are harming the environment? If you answered yes to these questions, SMWC’s environmental science major and minor will be of interest to you. This discipline helps students understand how various aspects of the natural world interconnect with each other and with human society, and prepares students for a variety of environmental science jobs. In addition to general studies courses and electives, the environmental science major requires 54-57 credit hours of coursework. A study of the major unifying concepts of biology at the molecular, cellular and organismic level, including a survey of the major groups of living organisms. Three one-hour lectures and one two-hour lab per week. Fall (141) and Spring (142), every year. Course fee. Introduces the basic chemical concepts of atomic structure, periodicity, and the chemical reactions of both gases and solutions, and the thermodynamics of these reactions. Three one-hour lectures and one three-hour lab per week. Fall, every year. Course fee. Prerequisite: One year of high school chemistry or consent of instructor. A continuation of the concepts presented in CH 115 as they pertain to reaction kinetics, thermodynamics, and equilibrium and acid-base and precipitation, and redox reactions. The concepts behind solids and liquids are also presented. A brief introduction to organic chemistry is included in the course topics. Three one-hour lectures and one three-hour lab per week. Spring, every year. Course fee. Prerequisite: CH 115. In this course students will use the fundamental principles of chemistry to gain an understanding of the source, fate, and reactivity of compounds in natural and polluted environments. Emphasis will be placed on the environmental implications of energy utilization and on the chemistry of the atmosphere, hydrosphere, and lithosphere. Environmental issues that will be discussed include climate change, air pollution, stratospheric ozone depletion, pollution and treatment of water sources, the utilization of insecticides and herbicides. The course will include a laboratory component in which students will perform indoor/outdoor experimental activities. Three one-hour lectures and one two-hour lab per week. Course fee. Prerequisite: CH 115 and CH 116. This is a required course for the Environmental Sciences major. This will be an elective course for biology majors and pre-professional majors. This course uses an interdisciplinary approach to our world to emphasize the history of environmental concerns, biomes, species interactions with each other and their environment, air, water, soil and biological resources, population dynamics, toxicology, energy sources, land use management, and other related topics. Principles of physics, Environmental chemistry, and biology are incorporated throughout the course. Laboratory activities allow direct application of the concepts learned in lecture. Three one-hour lectures and one two-hour lab per week. Course fee. Prerequisite: BI 141 or BI 101. This is a required course for the Environmental Sciences major and minor. This will be an elective course for biology majors and pre-professional majors. Critical study of current research issues in biology conducted in seminar fashion. Student research and the oral presentation of biological problems are major components of the course. A continuation of BI 225. Critical study of current research issues in biology conducted in seminar fashion. Student research and development of undergraduate research proposal are major components of the course. A continuation of BI 325. Finalization of undergraduate research proposal and oral presentation of proposed project are major components of this course. Critical study of current research issues in biology conducted in seminar fashion. Student research and the oral presentation of biological problem are major components of the course. A two-stage course under the supervision of a research adviser concerning the basic principles of research and problem solving methods in the biological sciences. The first stage consists of the actual research/internship to be completed by end of the first semester of senior year. The second stage consists of completion of research, data analysis, and preparation for communication. It is highly recommended that students in the environmental science major take MA 253 or BI 253 as the Woods Core math component. This course is necessary to demonstrate to students the use of mathematics and modeling in the use and conservation of natural resources. It will help students understand the fundamentals of resource management and how to predict population sizes and age structures of wildlife. This course will help make students more marketable and better able to consult and predict the outcomes of resource use. 15 credits. All courses listed. Studies the reactivity of functionalized hydrocarbons through the use of mechanism and orbital considerations. Unsaturated hydrocarbons as well as functional groups containing oxygen and sulfur are considered. Laboratory offers instruction in technique. Three one-hour lectures and one three-hour lab per week. Fall, every year. Course fee. Prerequisite: CH 116. Continuation of CH 222 considering additional functional groups such as aromatics, carboxylic acids, esters, and amines. In addition to synthesis, the interpretation of organic spectra is used as a tool for critical thinking. Biochemistry topics that pertain to organic spectra are used as tools for critical thinking. Biochemistry topics that pertain to organic topics are introduced. Laboratory offers instruction in synthesis. Three one-hour lectures and one three-hour lab per week. Spring, every year. Course fee. Prerequisite: CH 222. One semester introductory course designed to give students an appreciation of the dynamic nature of life processes. Chemistry of carbohydrates, lipids, proteins, nucleic acids and enzymes are studied and considered in their role in metabolism. Some modern biochemical reactions and isolation of compounds from natural sources are included. Three lectures and one three-hour lab. Course fee. Prerequisites: CH 222 and CH 322, or consent of instructor. This course deals with the function of nutrients, digestive processes, characterization of feedstuffs and formulation of diets for domestic animals. Deficiency disorders will also be addressed. Three one-hour lectures per week. Prerequisites: BI 141 and BI 142, or consent of instructor. 15-16 credits. All courses listed. Choose either BI 261, ID 460 or BI 335 as part of the concentration, the other two can be used as electives. Principles and concepts pertaining to the study of organisms and their biotic and abiotic environment. Includes consideration of interrelationships at the level of the individual, population, community and ecosystem. Three one-hour lectures and one two-hour lab per week. Course fee. Prerequisites: BI 141 and BI 142, or consent of instructor. Conservation and management of renewable resources such as soil, water, air, minerals, plants and animals in relation to the total environment. 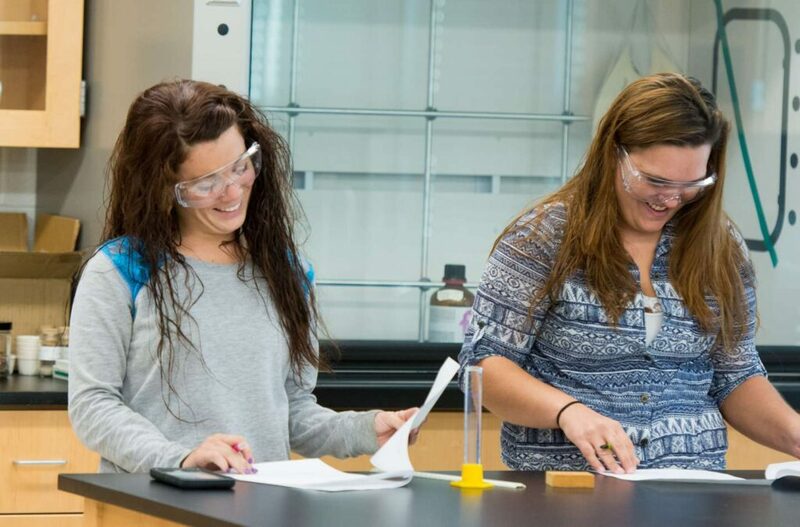 The 4-credit hour class consists of three one-hour lectures and one two-hour lab per week (the 3-credit hour course has no lab). As needed. This course examines wildlife as a natural resource, with emphasis on principles of conservation, ecology, and management. This course includes hands-on experiences, analysis of wildlife and natural resource problems and understanding basic ecological concepts associated with wildlife. It also includes habitat management practices, identification of wildlife species, analysis of policies, laws and regulations, and use and management of natural resources. This is a required course for the Environmental Sciences major with a wildlife concentration and the environmental sciences minor. This will be an elective course for Environmental Science with a chemistry concentration, biology majors, and pre-professional majors. Three one-hour lectures and one two-hour lab per week. Course fee. Prerequisite: BI 141 or BI 101. Focuses on Indiana’s diversity of organisms and ecosystems, including the geological and biological history of the state. Field laboratories will introduce students to the major taxonomic groups of organisms and local Indiana habitats. Two one-hour lectures and one two-hour lab per week. Course fee. Explores the development, causation, function, and evolution of animal behavior. Examines genetic, physiological, psychological, ecological and evolutionary influences. Investigates the behavior of organisms as individuals and in social groups. Three one-hour lectures and one three-hour lab per week. Course fee. Prerequisites: BI 141 and BI 142, or consent of instructor. This course examines what humans eat from multiple disciplines: biology and evolution; agriculture and environmental science; politics, business and economics; history, anthropology and culture; ethics and religion. The course will cover the history of food systems, leading up to a focus on the role of government and business in modern food systems, and the environmental impacts and sustainability of food systems. Finally, the course looks at individual food choices, from several perspectives including: nutrition, ethics, and cultural diversity. Choose two-must be a minimum of 6 hours. BI 240 for wildlife concentration only. BI 261 and BI 460 cannot be used for wildlife requirement above and as elective. BI 341, BI 340 and BI 450 for chemistry concentration only - BI 341 highly recommended. Study of major plant groups, their structure, function and ecological relationships. Three one-hour lectures and one two-hour lab per week. As needed. Course Fee. Prerequisites: BI 141 and BI 142, or consent of instructor. Field experiences in environmentally important areas (e.g., desert, grasslands, marshes) of the natural world which introduce the student to the interrelation of nature. Class presentations about the different ecosystems prepare the student for observation and investigation of the habitat; field experience included. Course fee. As needed. Application of biological principles to the study of the structure, function, origin and development of typical invertebrates. Field work may be required in addition to regular laboratory periods. Three lectures and one two-hour laboratory. As needed. Course fee. Prerequisites: BI 141 and BI 142. Introduction to the nutrition, physiology and ecology of microorganisms (bacteria, yeasts, molds and viruses) including preparation of media, role of microorganisms in health and disease and methods of control. Three one-hour lectures and one two-hour lab per week. Course fee. Prerequisites: BI 141 and BI 142. Social, political, esthetic, scientific and religious perspectives will be used to investigate topics related to issues of health in a variety of countries. Mathematical skills will be reinforced utilizing statistical information and manipulations of data related to health issues. Emerging diseases will be discussed and students will be asked to create a model of a current emerging disease and its probable occurrence in the next ten years. Studies the history of life and the process that produces its diversity and unity. Content includes natural selection, speciation, macroevolution and microevolution. Three one-hour lectures and one two-hour lab per week. Course fee. Prerequisites: BI 141 and BI 142, or consent of instructor. Research and discussion of one or more topics of current biological interest. For majors only. For those seeking secondary education certification, the topics will include drugs, human nutrition and social biology. As needed. Course fee. Prerequisites: BI 141 and BI 142. A minor in Environmental Science is advantageous to anyone interested in the interrelatedness of life and the universe. In addition, an individualized major may be developed in this area utilizing courses in the biology and chemistry areas. 22-23 credit hours are required. Choose one of the following course options (at least 3 credit hours required). Standard topics of elementary statistics: organization of data, normal distributions, estimation, hypothesis testing, correlation and regression, chi-square and analysis of variance. Additional emphasis on selection of methods and applications to biology, particularly genetics and for undergraduate research. Use of appropriate software. Prerequisites: BI 141 and BI 142, or consent of instructor. Appropriate score on the mathematics placement exam or completion of MA 117.